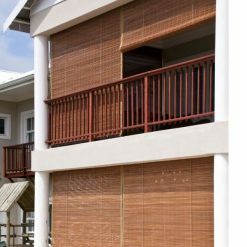 Blinds Direct offers your home premium protection from the sun with our stylish range of outdoor roller blinds. Outdoor roller blinds act like solar filters – keeping your home cool in summer and protecting your interiors from sun fade and prying eyes. 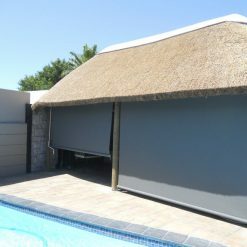 Outdoor roller blinds will transform any patio, braai area, veranda or decking into the perfect year-round entertainer space. Versatile, clean-cut and sleek in design, outdoor blinds allow for a unique extension of your home. These roll up blinds provide a comfortable, healthy indoor space, designed to protect against wind and rain, but still allow full visibility – so you can enjoy the view. The exterior blinds come in roll up, retractable styles and there’s a wide range of colours and sizes to choose from. Our outdoor roller blinds act as a barrier for windows and patios, filtering harsh sunlight and blocking up to 90 percent of UV rays, helping you save on energy costs by keeping your home cooler in summer and warmer in winter. Simple to install and easy to look after, the blinds can be customised to any height. 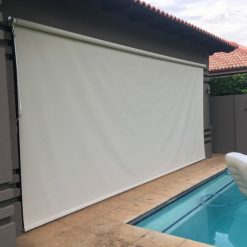 Our outdoor roller blinds are mounted outside and run down directly in front of windows and sliding doors of all sizes and even larger openings to create a pleasant outdoor area to enjoy. Durable and long-lasting, our outdoor roller blinds are low-maintenance and require little work for regular upkeep. When you choose to purchase outdoor blinds, we like to think of it as an investment for your future – something to enhance your home for the long term. Whether you are shading and reducing breeze into a patio area or keeping sunlight from overheating your home and fading your furniture, our outdoor roller blinds will provide many years of effective operation. If you have any questions about installing or maintaining outdoor blinds, don’t hesitate to contact us.